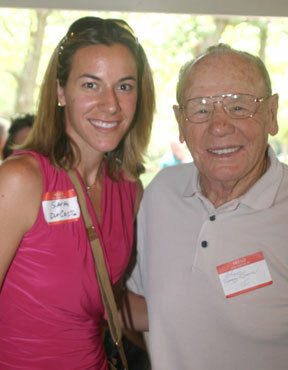 Providence, RI (6/12/2010): Sara DeCosta, a two-time goaltender for the U.S. Women’s Olympic team, will receive the R. I. Reds Heritage Society’s first annual R. I. Native-Born Hockey Achievement Award at group’s 10th annual reunion at Goddard State Park on August 1. DeCosta became the first girl to play in the Rhode Island Interscholastic League championship division. Her outstanding play helped Toll Gate become the first public school in 14 years to reach the best-of-three title round. As a member of the boys’ hockey’s team in high school, DeCosta was the squad’s MVP at Toll Gate High School in 1995 and 1996. In 1996-97, DeCosta enrolled at Providence College. That year, she had an 18-7-2 record and a 2.66 goals-against average, earning All-Eastern College Athletic Conference honorable mention her freshman year. 1996 also marked DeCosta’s first appearance for the U.S National team. In 1997, DeCosta did not play at Providence because she competed in the 1997-98 pre-Olympic tour. She played in nine games and compiled a 6-2-0 record, leading all U.S. goaltenders with a .941 save percentage and 1.30 goals against average. During the tour, five of her six victories were shutouts. Her performance cemented her spot on the 1998 Olympic team that eventually captured the gold medal in 1998. In 1998-99, DeCosta returned to Providence College and led the nation with a .943 save percentage, was fifth in goals against average (1.50) and had a record of 17-10-3 (seven shutouts). She was named 2000 USA Hockey Women’s Player of the Year and played exceptionally for the U.S. National team. DeCosta did not play at Providence her senior year, and instead played exclusively with the U.S. National team as they prepared for the 2002 Olympics in which she led her team to the silver medal. Today she is married to Mark Hayes and the Warwick couple has three children - a five-year-old daughter and twin boys ages three. During the winter she still plays hockey. Yes, in a men’s league. Her position? No, not in goal. She is a high scoring winger. After all the pucks she has stopped, maybe she wants to fire a few shots of her own at other goaltenders…all men.